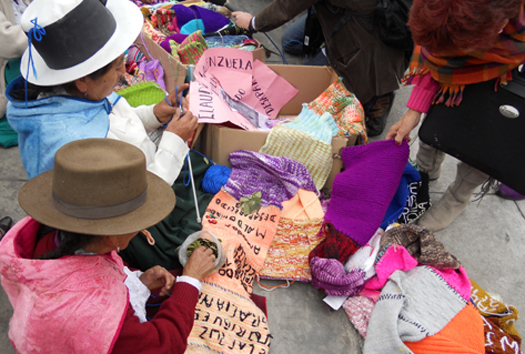 Photo: Women sit on the sidewalk in Peru, knitting the names of their disappeared loved ones on a scarf that exceeds 200 meters. These women's request is for the individual economic reparations they were entitled to after Peru's internal armed conflict. Thousands of victims of Peru’s internal conflict are still awaiting compensation and benefits as part of a 2005 national reparations plan, says a report released today by the International Center for Transitional Justice (ICTJ). The 36-page report, “Reparations in Peru: From Recommendations to Implementation,” looks at the government of Peru’s mixed record of providing compensation to individuals and communities that suffered some of the most serious crimes during the conflict. As the report outlines, programs born of the Comprehensive Reparations Plan have suffered from delays, changes in policy, and competing narratives about the conflict and its perpetrators—which in some cases have denied victims and their families the right to reparation. More than 69,000 people were killed or forcibly disappeared during Peru’s 20-year conflict. Thousands more were victims of torture, illegal detention, sexual violence, forced recruitment, and massive displacement. "Programs born of the Comprehensive Reparations Plan have suffered from delays, changes in policy, and competing narratives about the conflict and its perpetrators." A striking feature of the conflict, described by the Truth and Reconciliation Commission (CVR) in its 2003 Final Report, is that the majority of victims were Quechua-speaking indigenous civilians, living in the mountainous Andean and Amazon provinces. Their communities, caught in the middle of the struggle between rebel forces and the government, had already suffered from poverty, political exclusion, and persecution. Reparations were intended as a way to adequately compensate victims for the crimes they suffered, provide them with full rights, and lay the foundations of a new social pact. “Even though these violations happened more than twenty years ago, many victims continue to wait for answers and compensation,” says Cristián Correa, author of the ICTJ report, and Senior Associate with ICTJ’s Truth and Memory program. Peru’s national reparations plan, which is based on recommendations made by the CVR in its 2003 final report, provides different forms of reparations to victims to help them repair the worst consequences of the violence. Programs range from specialized health care and education to memorialization and monetary compensation, which is delivered as one-time cash payments of 10,000 soles (or USD$ 3,700). According to the ICTJ report, the government, so far, has implemented its reparations plan unevenly, with some programs receiving significant funding and attention, while others have gone virtually ignored. "They have navigated the long registration process to be recognized as victims and rights bearers—only to find that the government isn’t ready to deliver on legislated projects." According to official statistics, only one in five victims has received monetary reparations, and programs for education and health care have lagged behind. One of the largest programs to be implemented is Collective Reparations, which provides redress to victims on a collective basis. Through this program, communities have received investment projects of up to 100,000 soles (USD$ 37,000) to help rebuild their infrastructure and strengthen their ability to participate in development. Most projects have focused on livestock activities and building new irrigation systems, community halls, drains, additional schoolrooms, or roads. By the end of 2013, 1,946 communities will have benefited. "According to official statistics, only one in five victims has received monetary reparations, and programs for education and health care have lagged behind." The program, however, has faced some problems. According to the ICTJ report, residents do not always see investment projects as reparations. Instead, many view them as a welcome form of development to which they are entitled, as social and economic rights. For example, as part of a reparations project in Acomayo, documented by ICTJ and the Association for Human Rights in Peru (APRODEH), half of a street was paved near a health clinic. In part, the confusion between reparations and development arises because government representatives have fallen short in their obligation to link projects with an official recognition of harms suffered. The result is that collective reparations projects do not always go far enough in acknowledging serious crimes and commemorating victims. The CVR estimated that the Maoist rebel group the Shining Path was responsible for 54% of deaths and enforced disappearances. State agents, paramilitaries, and self-defense committees were responsible for 37%. It concluded that these violations not only were the result of individual excesses, but in some cases represented systematic practices that constituted crimes against humanity and transgressions of international humanitarian law. Still, portions of Peruvian society refuse to admit that the state was directly responsible for many violations that took place. Competing narratives about the conflict and a lack of acknowledgment of responsibility by many among the Peruvian elite help to explain the difficulties the country has had in implementing the reforms and reparations envisioned by the CVR. Learn about other transitional justice initiatives in Peru, or read about ICTJ's work on reparations around the world through our Reparative Justice program.